Iran's Foreign Minister Manouchehr Mottaki has travelled to Nigeria to discuss the issue with his Nigerian counterpart, Odein Ajumogobia, who told the BBC both countries would prefer to clear the air over the incident. "If the Iranians are willing to waive immunity, then we will pursue that," Mr Ajumogobia said. 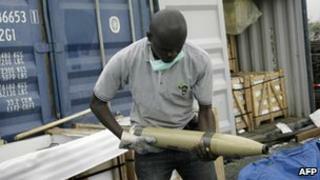 Nigeria's authorities have described discovering an arsenal in Lagos two weeks ago, which included rocket launchers, grenades and mortars. "That's been confirmed from our own shipping documents and the Iranian foreign minister," he said. "If Nigeria finds in the conclusion of investigations that there has been a breach of any sanctions, as a member of the UN Council we would do what is necessary," he said. It was initially feared that the weapons could be used in Nigeria - by oil militants in the Niger Delta, or Islamist radicals in the north or in elections due next year. But the BBC's Caroline Duffield in Lagos says security sources now believe Nigeria's port may have been targeted as a holding destination - thanks to the country's reputation for corruption and lax regulations. The France-based shipping company CMA CGM says there were attempts to send the containers on - to The Gambia, in West Africa - before the Nigerian police seized them.